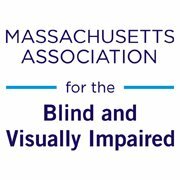 Fast forward to today: I found a job working for the Massachusetts Association for the Blind and Visually Impaired, and for the first time in my life found myself working with and alongside visually impaired individuals everyday. I realized that these individuals could do pretty much anything a sighted person can do, if given the proper support: I met blind finance executives, lawyers, IT professionals and yes, even runners. I met people who’d lost their vision and then decided to run marathons and complete triathlons – if they could find great guides to be their “eyes” on the race course, then they could compete alongside the sighted athletes, no problem. If they can do it, I thought, then why can’t I? So I decided to do the Blindfold Challenge, an event co-sponsored by four Boston-area blindness organizations: the Carroll Center for the Blind, the Massachusetts Association for the Blind and Visually Impaired, National Braille Press, and Perkins. The Blindfold Challenge is to run a 5K race blindfolded, teamed up with a sighted guide, to simulate the experience of running blind. This year’s Blindfold Challenge was held at the B.A.A. 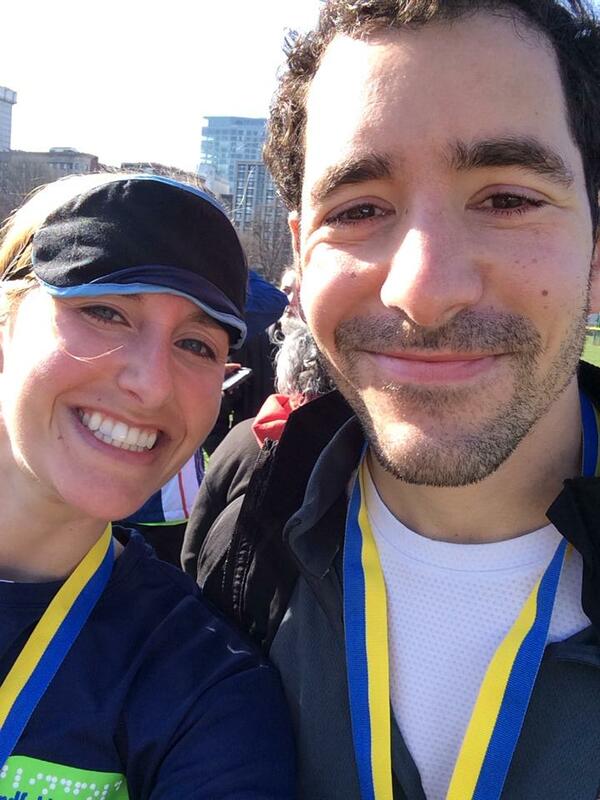 5K, located at the end of the historic Boston Marathon course, a sold out race at 10,000 runners. I chose my boyfriend Giulio as my teammate, so for us the Blindfold Challenge doubled as both an exercise in teamwork and couples communication. 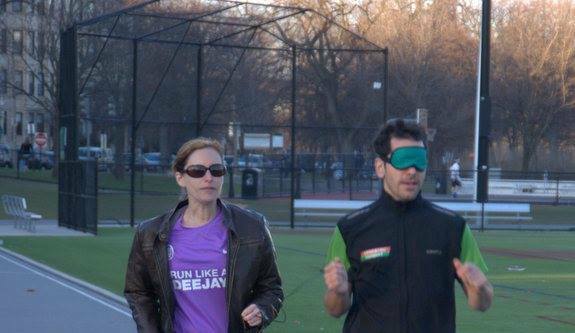 Before race day we went to a training: my friend Joe Q., an NBP staff member who is visually impaired, trained us how to run as a blind/visually impaired runner-sighted guide team. Joe explained how to use a shoelace as a tether to connect the two runners, how to give verbal commands to guide the blind runner, how to navigate a race course without relying on sight. Giulio and I decided that each of us would practice being the blindfolded runner and the guide, since we each wanted to experience running blind. It was time for us to practice running. First I guided Giulio, leading him around the track at Joe Moakley park, calling out when to turn left and right. Giulio was a natural, having little difficulty eliminating his vision and running ahead fearlessly. When it was my turn to don the blindfold, however, I was … pretty much a mess. The minute I started walking forward blindfolded, I realized I had no perception whatsoever where I was going. My usual lack of spatial perception can actually get worse – without my sight. Once my vision went dark, I started tuning in more accutely on my other senses: I became more focused on my hearing, feeling as if the sounds of the park around me were suddenly magnified, much closer to me. The sounds of the lacrosse game next to us became louder for me, disorienting. “Are we going through the game?” I began to panic. Apparently running blind wasn’t easy at all. “No, we’re still on the track – you have to trust me, Elizabeth!” Giulio replied. It all came down to that: trust. A blind athlete running the Boston Marathon has to put complete trust into his or her guide, relying on them to anticipate obstacles, lead to water if needed, basically ensure their safety on the course. So if we were going to be successful in the Blindfold Challenge, we were going to have to trust each other completely. The morning of the race I woke up at dawn, my stomach doing flips in anticipation. We decided to run to the 5K course from our Cambridge apartment to warm up our muscles before the race and get in some last minute practice – after my disastrous reaction to being blindfolded at our training, Giulio figured I could use all the preparation I could get. As we ran alongside the Charles just after sunrise I began to relax, getting in to my stride. When we arrived at the 5K start it was a madhouse – we crammed in the chute alongside thousands of other people. I knew that once the race started even with our bib with “guide” written in red letters, it was still going to be tough. I was running blindfolded first: we agreed to trade of at the halfway point on the course so we could each get the experience. The national anthem began and I knew it was time. I put on the blindfold. We began to run – well, shuffle, at first – forward. Giulio led me through the crowd slowly, until finally we got out into enough space to run. I began to pick up my feet faster. One foot before the other, I told myself. Hold the tether. Follow Giulio. He will guide you. My eyes clenched shut underneath the blindfold, I tried to focus on my breathing and not the sounds of the race around us. “We are turning left in 10 kilometers,” Giulio warned me, and I began to ease into the turn. I felt the tension of our tether tighten as he guided me along the course, I felt the ground beneath my feet and the wind in my ears. “Is this pace ok for you?” He asked me cautiously. “I’m good,” I said, surprising myself. “Actually I can go even faster!” We began to pick up more speed, move from a jog into a run. I’m actually doing this! I’m running blindfolded! As we approached the underpass on Comm. Ave Giulio warned me that the ground was sloping downward. All around me runners began to whoop and cheer, their screams echoing off the cement walls of the cavern. For me the sound was jarring, disorienting, impossibly loud. I grabbed Giulio’s arm and he guided me through the chaos. We were getting to the halfway point already. Time to switch. Quickly I took off the blindfold and handed it to him: now it was my turn to be the guide. As we came to the first turn I called out in anticipation, “we’re turning, stay close to me!” Now with the blindfold off I realized how close we were to so many other runners all around us. A woman darted out directly in front of us, oblivious with her headphones on and paying no attention to our tether and guide bib. She jumped close in front of Giulio and he smacked into her. Luckily she didn’t fall. “Blind runner!” I yelled, looking back as we passed her. “She just wasn’t paying attention, I’m sorry – it happened so quickly!” I pulled on the tether to keep him closer as we cut through the crowd. We turned on to Beacon Street and a lane of open space opened up. “We can pick up the pace!” I said, and Giulio happily began to run faster. I could see the Marathon finish line up ahead of us, the bleachers set up, the overhang, the bright yellow painted “Finish” on the road before us. “We’re coming to the marathon finish line!” I told Giulio excitedly. Up ahead of us people were stopping to take pictures at the famous spot, which after last year’s bombings have become almost iconic. We were getting closer, I felt my heart leap into my throat. Would I tear up? Don’t get emotional and run Giulio into a pole or something. I had to keep it together, to keep guiding Giulio through the crowds. When our feet touched down to cross the bold yellow line, I didn’t cry. Instead I let out a whoop of joy. “We just crossed!” I yelled to Giulio, and he put up his fist into the air. We barreled along ahead, running as fast as we could. Finally we’d reached the end of the course, and we slowed, back in the chute. Giulio took off the blindfold. “You did it!” I said. “We did it,” he replied. We finished 5K in 30 minutes, a couple minutes slower than I would have had we not been running with the blindfold. Yet more than any other race that I’ve run, I felt an amazing sense of accomplishment: I had tested myself in a way that I once would have never thought possible, and proved that even I could do it. I experienced firsthand the challenges that blind individuals experience every day, and I have that much more respect – it’s not easy, in fact it’s hard work. But with the right support, anything is possible. Typically when someone hears that you’re running a marathon, their first question is “Why?” Why on earth would someone choose to run 26.2 miles? What motivates someone to travel across the country or around the world for that matter, to spend their day running up and down hills in totally unpredictable weather? I can’t speak for the rest of the running world, but this weekend’s California International Marathon (CIM), in Sacramento, confirmed my motivation for running and racing. Three and a half years ago I laced up my first pair of running shoes. I was physically un-fit, incapable of running a mile, and a bachelor. Since then, I have dropped 45 pounds, run 12 marathons, met a number of amazing and talented new friends and athletes. Heck, I even married one of them! 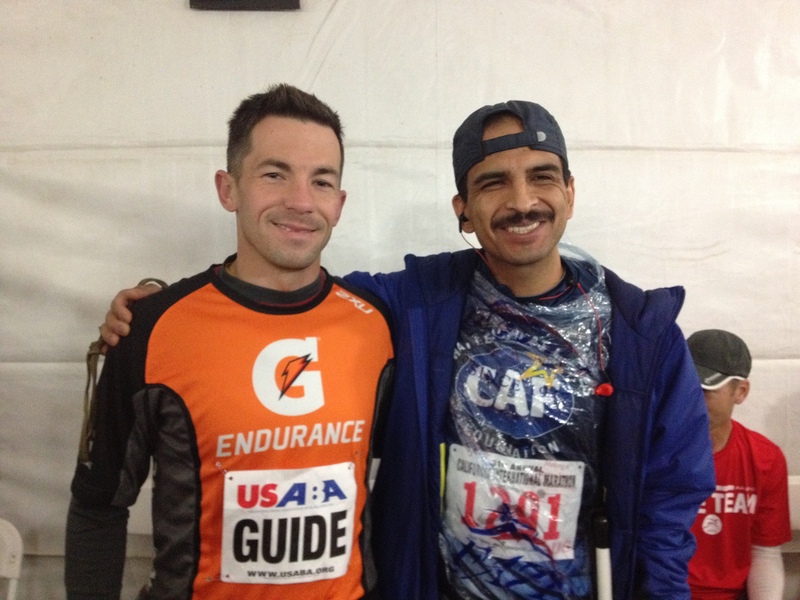 At this weekend’s California International Marathon, while shivering in a tent at the starting line, surrounded by friends, inspiring athletes, and selfless sighted guides, I realized that I run for the relationships. As Annual Giving Manager at the Massachusetts Association for the Blind and Visually Impaired (MABVI) and manager of Team With A Vision, MABVI’s Boston Marathon Team, I have been fortunate enough to have met some truly inspiring athletes over the years, many of whom are blind or visually impaired. Throughout the year we stay in touch with one another byway of Facebook and E-mail, but it is really only twice a year that we all meet at the same two running events, the Boston Marathon, and the United States Association of Blind Athletes‘ (USABA) National Marathon Championship, at the California International Marathon. 12:30 PM: After a short layover in Chicago, my plane touches down in Sacramento. It’s two days before the 2013 California International Marathon, and the atmosphere at the airport is electric. Everywhere you look, men and women of all shapes and sizes wearing warmup pants and track shoes are deboarding planes. Many carry backpacks or wear windbreakers donning the dates and insignias of previous races that they have presumably run, while others drag their wheeled luggage behind them with their race shoes strung over their shoulder. I traveled with Kyle Robidoux, Director of Volunteer & Support Group Services at MABVI. This is my second time running the CIM, and it’s Kyle’s first. 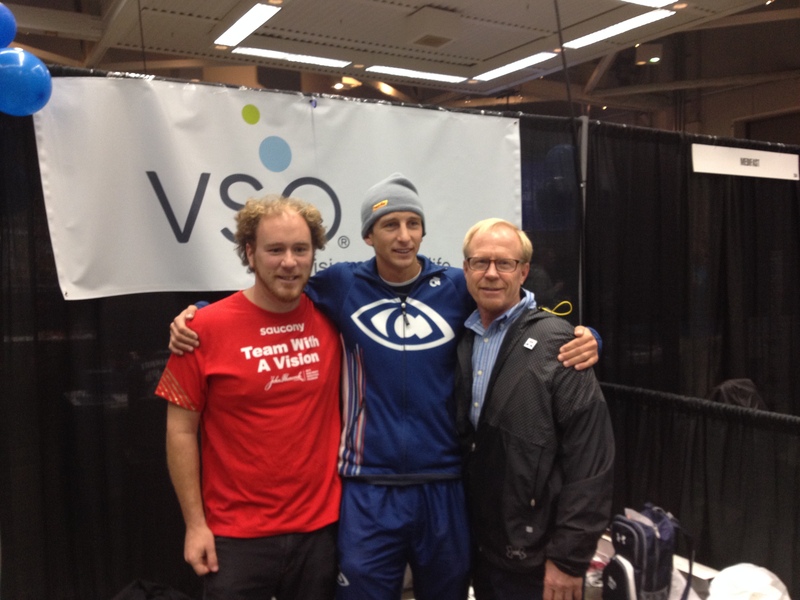 As a visually impaired marathoner, this is also Kyle’s first time running a race where he’s not the lone blind athlete. Kyle and I make our way down to the baggage claim, where we run into Stephanie Timmer and Bronwyn Funicello, two visually impaired runners easily identified by their running gear and white canes. Stephanie, a former U.S. Marine and decorated Paralympic athlete, and Bronwyn, a Canadian athlete and elected official, have both just arrived as well. We say hello, and set off to pick up our rental car to drive to the sports expo. As we walk to the shuttle to take us to our car, Kyle and I realize that we haven’t escaped Boston’s cold December temperatures. In fact, sunny California is a few degrees colder than Boston. On our way into the sports expo, we meet Mark Lucas and Ryan Ortiz, Executive Director and Assistant Executive Director of the USABA. For much of the marathon weekend, Mark and Ryan are the guys behind the scenes, arranging transportation for athletes, introducing donors to runners, coordinating with local vision related groups and making sure that everyone has what they need for Sunday’s marathon. 2:00 PM: Inside the expo, Kyle and I pick up our race packets which included our bibs, timing chips, important information about the weekend’s schedule, and our race shirts. We then head over to the USABA table to meet our friends Erich Manser and Richard Hunter. As we near the table, we notice that a small crowd has gathered. Richard and Erich, two larger-than-life visually impaired athletes, are chatting with donors, runners, and friends about their involvement with the CIM. Erich, an accomplished runner, triathlete, Paralympic swimmer and fellow Massachusetts native, is nursing a knee injury and will be running on a relay team during Sunday’s event. 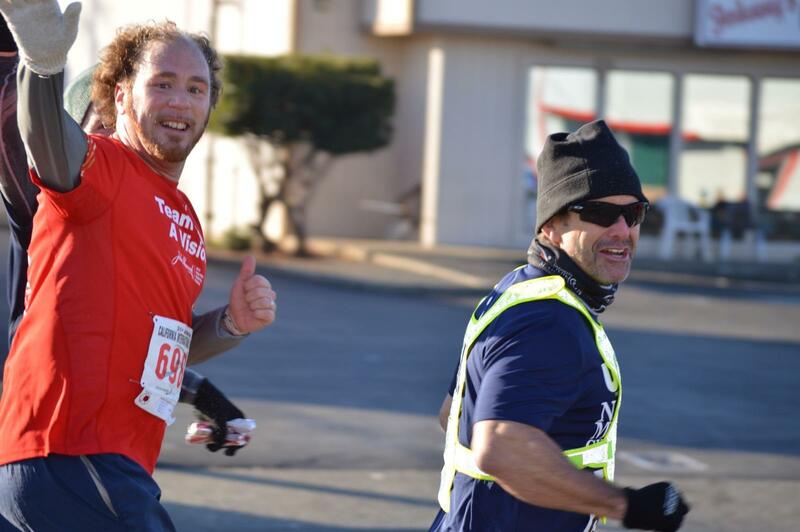 Richard, a former U.S. Marine, Ironman triathlete, ultra-marathoner, and the man who built up the visually impaired division at the CIM to what it is today, is also recovering from an injury. 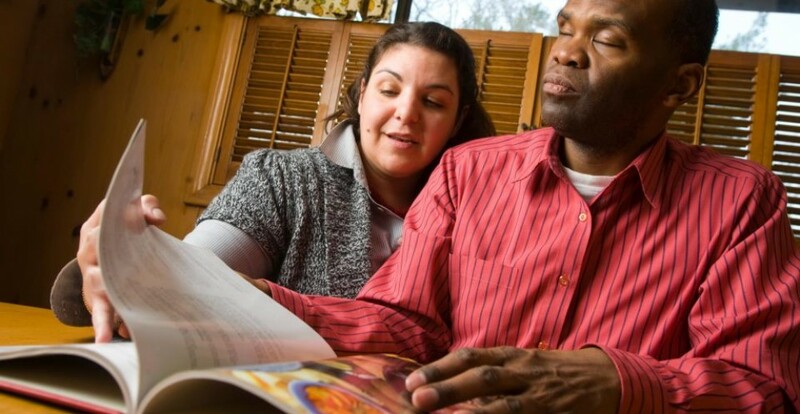 On July 5, 2013, Richard was riding his tandem bike, with friend and sighted guide Justin Waller, when a driver hit them head on. Richard awoke with his head on the lap of the car’s driver and half of his body pertruding fom the windshield of her Chevy. Suffering from massive lacerations, facial fractures, and a broken neck, Richard was life-flighted to the hospital. Now, just six months later, Richard is ready to toe the line and run. 3:30 PM: After the expo we drive to Richard’s house, where he and his wife Heidi are hosting a small group of runners and sighted guides. There we meet Steve Baskis, Cathy Champion, and Brad Snyder, all wounded warriors who lost their vision as a result of combat injuries. We also meet Danielle Zemola, an attorney and Delta Gamma Alumna who won a national essay contest to guide Brad during Sunday’s race. 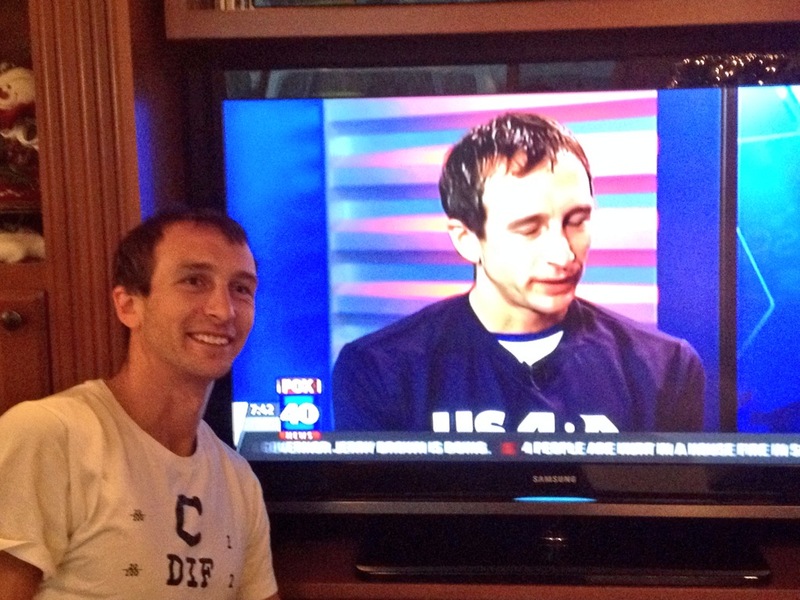 Also at Richard’s house is my good friend Aaron Scheidies, International Para-Triathlon Champion and Men’s Visually Impaired Division winner of the 2011 & 2012 California International Marathons and 2012 & 2013 Boston Marathons. 8:00 PM: Stuffed with Heidi’s homemade macaroni and cheese, chicken, and salad, and exhausted from our transcontinental flight, Kyle and I leave after dinner and head to Heidi’s mother’s house just a few miles away. Inga, who I stayed with while in Sacramento for last year’s race, is waiting by the door and greeted us with open arms. After catching up with Inga, Kyle and I catch up on our sleep. Today is just the first day of what is certain to be a very long weekend. 8:30 AM: Kyle and I wake to find a feast waiting for us on the dining room table. While we slept, Inga has been hard at work baking cinnamon rolls and fixing eggs, bacon, and a pot of coffee. After breakfast, and perhaps with a bit too much food in our bellies, we go in to downtown Sacramento to meet with other visually impaired runners and sighted guides for coffee. At Starbucks we find Rachel Weeks, a visually impaired marathoner and Ironman triathlete, and her guide Kelly, along with paratriathlete and marathoner Michael Stone and his guide Brad. Much like last night’s dinner, and our impromptu meetings with other visually impaired runners and guides at the expo and the airport, this is one of the many opportunities throughout the weekend to meet with athletes face-to-face that I spend the entire year speaking to on the phone and on the computer. It’s great spending time speaking with Rachel. She tells me all about the new business that she and Kelly are starting, called The Living Athlete, which provides life coaching to athletes from all disciplines. She and I also talk about her game plan for Sunday’s race, and how she is going to achieve her 5 hour qualifying time for the 2014 Boston Marathon. 11:00 AM: Kelly, Rachel, Kyle and I head back to the sports expo, where we find Aaron signing autographs at the USABA table. Here we also catch up with Rose Sarkany, an accomplished visually impaired runner from Canada, and a few other runners and guides who are participating on the USABA’s various relay teams. After heckling Aaron for a few minutes, and having him sign an autograph for my wife, which reads, “To Josh Warren’s Better Half…”, our crew of runners and guides set off to find a sports bar where we can sit back, relax, and watch some college football. Watching college football with a group of friends who have varied visual abilities is perhaps one of the most interesting parts of the weekend for me. We find a table that has optimal lighting and an appropriate proximity to a big screen TV. Aaron, who is perhaps the biggest college football fan I’ve ever met, watches the game through a small pocket sized telescope, and on a few occasions consults with others at the table to confirm what’s happening on the field. Our group catches the attention of a few other sports fans at the bar, many of whom must wonder why our cheers are sometimes a few seconds behind the play or call on the field, and one guy who asks what Aaron is watching the game through. 4:30 PM: Our time relaxing and watching the game is short-lived and before long we’re back in the car and on our way to the USABA pre-race dinner. There, we find ourselves in a room surrounded by 33 blind and visually impaired runners, their sighted guides, friends, family, and many more supporters of the visually impaired athletic community. Mark Lucas of the USABA kicks off the event by introducing some of the runners who have traveled from as far away as Jordan and the Dominican Republic. After a very kind and deserved introduction, Mark passes the microphone off to Richard Hunter, who walks to the stage as everyone in the room stands and cheers. Richard thanks the event sponsors, introduces a few of the athletes in the room, and recounts the story of being hit by a car back in July and how many of the individuals in the room were his inspiration as he regained his strength and prepared to run this year’s CIM. Dinner ends with runners and guides meeting to discuss logistics for Sunday’s race. This time also affords me the opportunity to see two friends who I hadn’t seen since the 2013 Boston Marathon, David Kuhn and Dan Berlin. Eventually, Kyle and I go back to Inga’s to rest up for the big day. 4:00 AM: The time to get up comes mighty early on Sunday. After a bowl of oatmeal and a cup of coffee, Kyle and I set off to meet the other USABA athletes and catch a bus to the starting line. When we arrive at the buses, it’s 28 degrees and there are two inches of snow on the roof of the bus. Coming from Boston and anticipating warmer weather here in California, Kyle and I both packed shorts to race in. We know we are in for a cold day. The bus drops us off at the starting line, and we shuffle across slick icy streets to a tent that awaits us. Here, runners huddle for warmth, exchange handshakes and high fives, and continue our pre-race ritual of applying Vaseline to various body parts, cramming a few last minute calories, stretching, and queueing up songs our iPods. Under the tent I find my friend Adrian Broca, the athlete at the CIM with perhaps the most Boston Marathon medals under his belt. While some runners remove heavier layers leaving them clad only in thin layers of spandex, others, like me, add layers in preparation for the run. Luckily, Aaron and I are about the same size, and he lends me a spare pair of tights. 6:59:30 AM: The race director sounds the air-horn, and wheelchair division athletes begin their 26.2 mile trek to Sacramento. Thirty seconds later, the rest of us set off on the same path. Out on the course the water stops are like ice rinks. Cold temperatures make for slick surfaces as 15,000 feet pound the pavement. Feeling unsteady on own my feet, I begin to worry about runners out on the course who have low or no vision. Having borrowed a pair of running tights from Aaron just before the start, I look at my watch and decide that he must have left some of his speed in the legs. I hit the half-way marker in one hour and thirty-three minutes and ten seconds. I am going way too fast, and I know that I can’t sustain this pace. As Sacramento nears, and as fatigue set in, my overall pace slows to eight minutes and fifteen seconds. 9:50 AM: Two hours and fifty minutes after the start of the race, the first visually impaired runner crosses the finish line, and shortly there after we are all reunited in front of the state’s capital building. More hugs, handshakes and high fives are exchanged, and everyone rallies behind the Visually Impaired Division’s winners, Aaron Scheidies, Adrian Broca, Matt Oliver, Stephanie Timmer and Rachel Weeks. Additional kudos are given to Kyle Robidoux, who set a new personal best, and Thomas Panek who along with Rachel qualified for the 2014 Boston Marathon. 3:00 PM: Our day ends with an awards ceremony where again we celebrate the accomplishments of all of the blind and visually impaired competitors and guides at the CIM. Medals are distributed, cash prizes doled out, hugs and goodbyes exchanged, and our muscles tight from a long day of running, we all limp our separate ways. As I reflect on this weekend’s race, I anxiously await my next. Not so much for the run itself, but for the opportunity to respond to the question, “why,” with “for the relationships.” Over the last three and a half years, running has introduced me to some great friends, inspiring athletes, and an amazing wife. It has allowed me to explore new cities, towns, and countries, and it has given me a new lease on life. The next big event for Visually Impaired marathoners is the 2014 Boston Marathon, scheduled for Monday, April 21, 2014. I hope to see you there! If you’d like to be involved with the 2014 Team With A Vision, please e-mail Joshua Warren at jwarren@mabcommunity.org.